I'm not surprised these little cakes were devoured, Mairi! They are so tempting and I do love anything raspberry. My mom made lots of pineapple upside down cakes in the 70s, too! As we're moving into fall/winter here, I'm thinking cranberries may work well. Looks like a dollop of cream or mascarpone on the side wouldn't go amiss there either. I love raspberries and sponge (think I'll pass on the maraschino cherries!). That or even some clotted cream! And agree with you on the maraschino cherries!! Hi Alessandra, thanks :) And yes sure I can host November...I cannot believe it has been 2 years!! I know, when I looked I couldn't believe it either!! 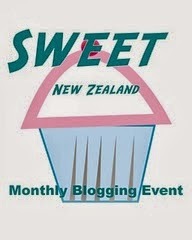 I'll notify Lucy and put your name down on the SNZ page. These looks yummy! And I think strawberries would be great too, as raspberries are rather expensive over here. And I do miss the pineapple upside down too, been ages since I last saw or ate any! Thanks Joyce :) Strawberries yes they'd be wonderful too. I am just seeing the first ones of the season now. Thanks Zosia, you may well be right about the raspberries! I wish I lived near you - the aroma of these babies baking must have been amazing! What lovely little cakes! I am a fan of the soft juicy cake ... and I agree that some whipped cream would be just the topper! PS My mom puts marachinos in the pineapple rings on the upside down cake too - it's required! I love little individual cakes like these! Gorgeous little cakes, and I can easily imagine woofing down a few of these - it would definitely be "hold me back" at the morning tea table! This looks delicious. 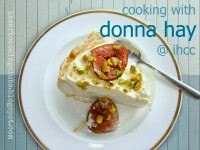 I love Donna Hay recipes and you did it justice. Thanks Chaya, they weren't quite picture perfect but they did taste good! Had to laugh b/c I very well remember the 1970s pineapple upside down cake! Thanks Michelle, yes baking not my strong suit either but always happy for a little experimentation! Raspberries are my very favorite fruit so I wanna say there is no such thing as too much raspberry! I bet these were scrumptious!! Great choice. Thanks Kim...maybe just a little too much for the little cakes but still delicious! Oh, these little raspberry cakes look sinfully wonderful...I don't think there is a possibility of ever having too many raspberries in a cake, do you? So pretty, too. I would need to make these when I was sure others were around to help me eat them or one could turn into two or maybe three. Thanks Kayte, yes I tend to only bake when it is for a crowd otherwise I'd be eating way too many cakes! I like your little cakes. Donna's goodies are always a treat. They look delectable. Unfortunately we do not get Raspberries here but will try them with strawberries. Thanks Lucy, something about individual that is just so cute!